>Consider this post to be like one of those emails with a subject line something like “Fwd: Fdw: Fdw: YOU MUST SEE THIS.” You know the one you think you are going to delete but then end up reading and then are glad you did. I offer a slight warning: If you are an American – meaning a citizen of the U.S.A. (as I am) and not the many millions of others living in the Americas – don’t be put off by the fact that the video comes from the Socialism 2009 conference. I say this not merely because you shouldn’t be afraid (a tendency in this country) of political/economic ideologies that are both more democratically minded as well as more committed to social justice & equality than our own current system, but because John Pilger is one of the finest journalists in the world today and has been for many years. His take on Obama, American exceptionalism, propaganda, and current trends is wonderful and, I think, hits the nail of the head. It is difficult for me to listen to Pilger because he describes exactly what I knew I was going to get when I voted for Obama. I voted with my pragmatist’s hat on, voting against McCain and excited to see change. But I knew in my heart I would not see real change. I knew all that was fundamentally wrong with our current military industrial system, our socioeconomic structures, and our hierarchies of power within and without the borders of this country would remain the same and probably reinforced. That is what we have in Obama, a better politician and president than we have had the previous eight years, but also the same. On the other hand I love hearing Pilger say what needs to be said and to do so in a way U.S. journalists rarely can. I have become increasingly convinced that the state of mainstream journalism in the U.S. today is lousy. If we do not take the time to find and engage with good journalism, rather than merely consuming the mainstream media, then we are and will remain ignorant and potentially very foolish. One of the truest clichés is that war is hell. Today is 65 years since Operation Overlord began – also known as D-Day. This day stands as one of the great moments of triumph in the wars of good versus evil that are seared into our consciousness. I have always viewed the actions of the soldiers who landed on the beaches to be nothing short of heroic, and I still do, but I am burdened by the casualties from the event. 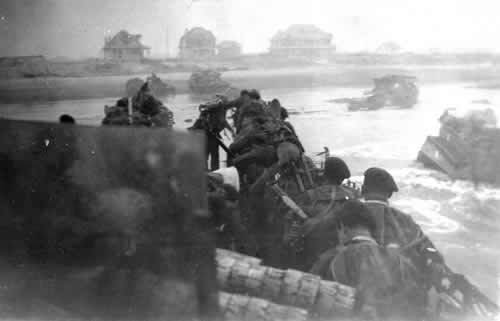 I wrote a post recently on my attitude towards war and I must confess I have difficulties bringing together my hatred of war and my thanks for the heroes of D-Day. British commandos in a ruined French town, Normandy. The cost of the Normandy campaign had been high for both sides. From D-Day to 21 August the Allies had landed 2,052,299 men in northern France. The Allies lost around 209,672 casualties from June 6 to the end of August, around 10 % of the forces landed in France. The casualties breaks down to 36,976 killed, 153,475 wounded and 19,221 missing. Split between the Army-Groups; the Anglo-Canadian Army-Group suffered 16,138 killed, 58,594 wounded and 9,093 missing for a total of 83,825 casualties. The American Army-Group suffered 20,838 killed, 94,881 wounded and 10,128 missing for a total of 125,847 casualties. To these casualties it should be added that no less then 4,101 aircrafts were lost and 16,714 airmen were killed in direct connection to Operation Overlord. Thus total Allied casualties rises to 226,386 men. 78 Free French SAS (Special Air Service) killed, 195 wounded in Brittany from 5 June to the beginning of August. For Allied tank losses there are no direct number. A fair estimate is that around 4,000 tanks were destroyed, of which 2,000 were fighting in American units. The German casualties remains unclear. The estimates of the German casualties stretches from 288,000 men to 450,000 men. Just in the Falaise Gap the Germans lost around 60,000 men in killed, wounded and captured. 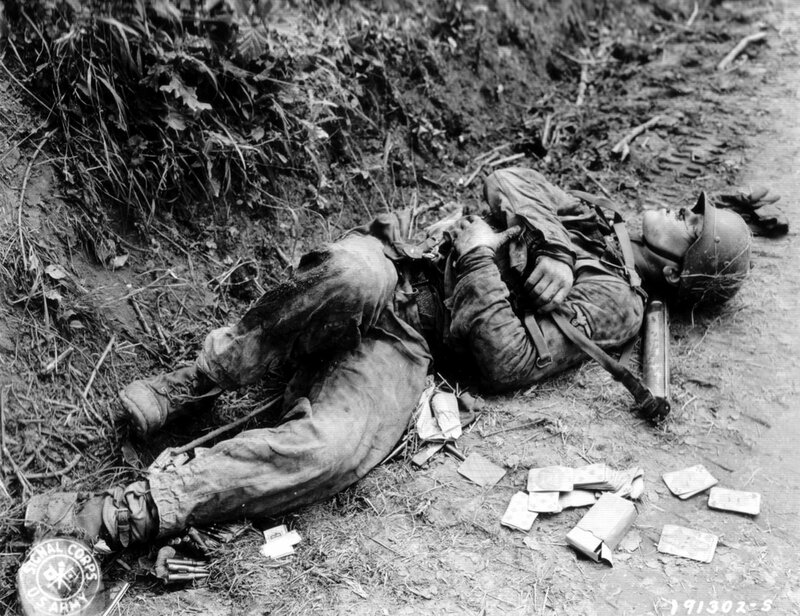 The majority of the German casualties contained of POWs as nearly 200,000 were captured during the closure of the battle. The Germans committed around 2,300 tanks and assault guns to the battle in Normandy, and only around 100 to 120 were brought back across the Seine. The overwhelming majority of the German tanks destroyed were put out of action by the Allied airforce, while very few of the Allied tank losses were inflicted by the Luftwaffe. 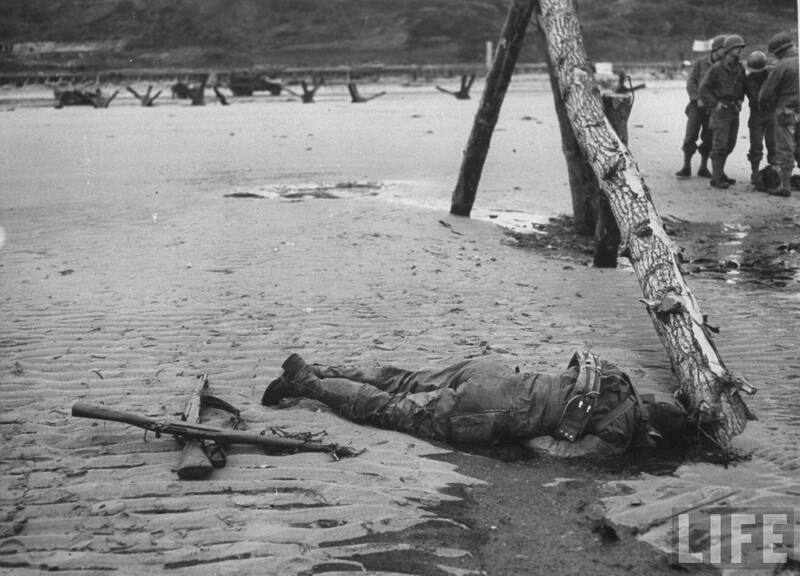 19,860 French civilians were killed during the liberation of Normandy, and an even greater number were wounded. The number excludes the 15,000 civilians killed and the 19,000 wounded in the bombings of Normandy in preparation of the invasion. 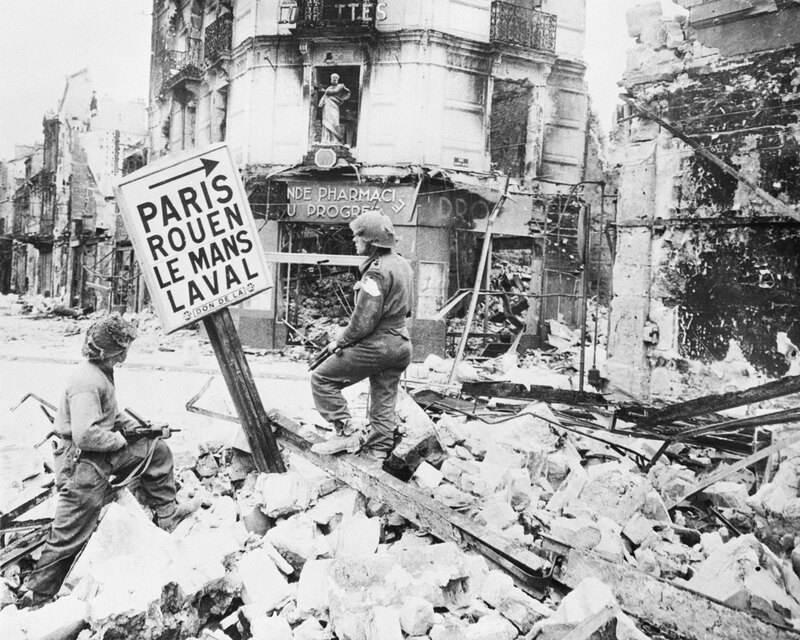 Many cities and towns in Normandy and northern France were totally devastated by the fighting and the bombings. As many as 70,000 French civilians may have been killed during the liberation of France in 1944. These numbers are staggering. Keep in ming that is for less than two months of fighting and such losses are entirely unbelievable by today’s expectations. D-Day is considered a great triumph. It was the first major stake through the heart of European fascism and Nazi ambitions. We use the words “saved the world from fascism” and “liberated Europe” when we talk about D-Day and its heroes. I have always had strong emotions about WWII and D-Day. The opening sequence of Saving Private Ryan truly chokes me up. I spent hundreds of hours as a kid pouring over my WWII book collection, closely examining photographs, reading the stories, and wishing I had been there. However, D-Day can also be seen a part of a huge failure. A failure not merely because there where many political options not exercised by the Europeans and Americans all through the 1930s that could have dealt with the rise of Hitler and fascism and avoided war altogether, and not merely because one source of WWII was the WWI (the war to end all wars) which also could have been avoided but was entered into with relish by all sides, but D-Day is a failure because all war is failure. War is a powerful and profound testament of human evil. To seek war, whether from selfish ambition, glory, or even from a felt obligation is, to use an old but still valid term, sinful. More than ever on days like this one, where we appropriately remember the sacrifices of so many human lives for causes that we believe in, I am in conflict. Should those soldiers have stormed the beaches in Normandy 65 years ago to save the world? Maybe not, for war is wrong. And yet they did and I am grateful they did. So today I will remember what those soldiers did and what they gave (in fact I am in awe of their service), but I will also remember and grieve the casualties on all sides, including the civilian casualties, and I will remember that the human tendency to war and glorify war is my tendency too because I am a sinner. >The 1960s (which really ran from about 1956 to 1974) produced some of the greatest anti-war songs. For example follow this link and look under Vietnam War. During the 1960s music played a huge part in how people thought and felt about the Vietnam War, war in general, and violence around the world. Today there is a War on Terror (whatever that means) and there is music being produced in response as well – follow that same link and look under 9/11, War on Terror, and Iraq. But, and tell me if I am wrong, the anti-war music of today is not yet anywhere near the cultural impact as during that famous previous era. Of course, neither is the anti-war movement itself. I have to say none of these songs do it for me. The first two are nice soul searching and sad, but so what? I want anti-war songs that shake it up, move me to action, rally the protesters, and most especially, songs that people can sing along to. The third song is a critique of U.S. foreign policy. Although I agree with some of the sentiments in that song, again it just doesn’t work. It doesn’t say anything new and the video is mostly distracting. Maybe what needs to happen first is a stronger groundswell of anti-war sentiment. We need more protests, more action, more visible activity on the whole if we want songs that can rally us. And it should not have to be the old-timers from the sixties that lead the charge.